Turkey’s main opposition leader has echoed the government’s strong calls to the United States for the extradition of Fethullah Gülen to Turkey over evidence linking the self-exiled cleric with the July 15 coup attempt. “Fethullah Gülen must be extradited to Turkey. 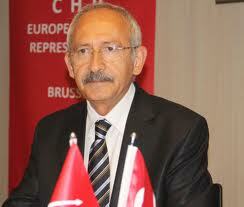 If he is seen as responsible for these massive incidents and if Fethullah Gülen says, ‘I want to be acquitted,’ then he must come and be prosecuted by the impartial Turkish courts,” Kemal Kılıçdaroğlu, leader of the main opposition Republican People’s Party (CHP), told reporters on July 26. “The government’s request for extradition and sending ministers [to the U.S.] are positive steps for us,” he said. The government has already sent four separate dossiers to the U.S. for the extradition of Gülen to Turkey after the July 15 failed coup attempt and will reportedly send another one with evidence proving the cleric’s role in staging the putsch against the country’s democratically-elected government. Turkey will send Foreign Minister Mevlüt Çavuşoğlu and Justice Minister Bekir Bozdağ to the U.S. to discuss the extradition process of Gülen. The ministers are expected to hold talks with their counterparts next week.